Hey party peeps! Who’s excited for Halloween? ME!!!!! 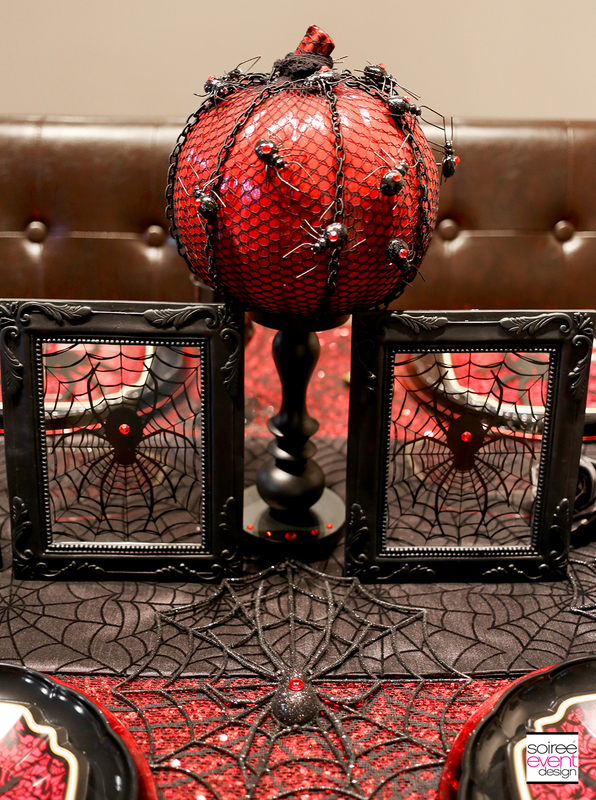 I kicked off a 3-part series on how to DECORATE YOUR HALLOWEEN TABLE 3 WAYS Today, I’m premiering my 2nd table, a spooky BLACK WIDOW SPIDER THEME! 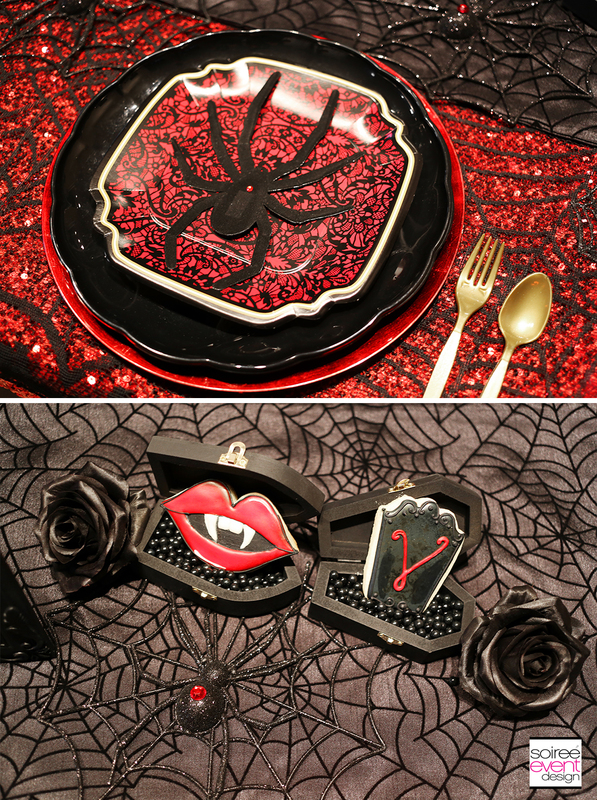 These three posts are full of Halloween decorating ideas to make your Halloween dinner party amazing! HOW DID SHE DO THAT? – THE INSPIRATION! 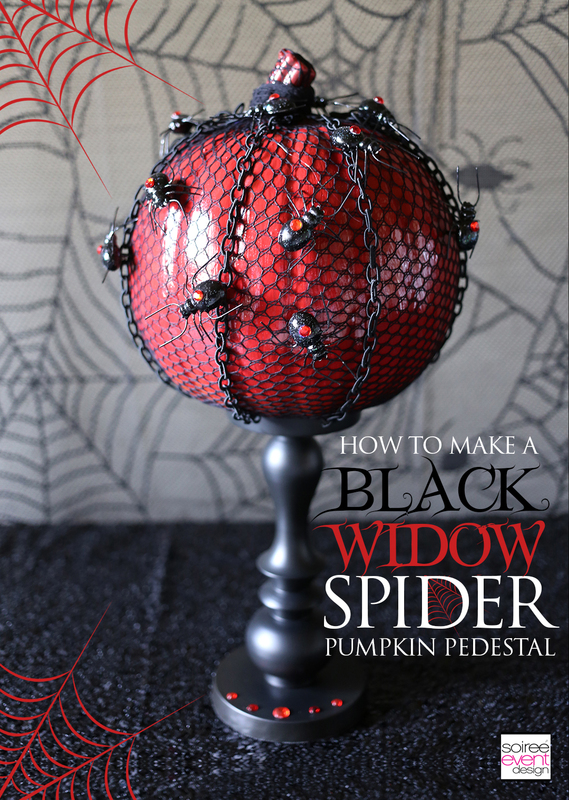 Last year I did a Black Widow Dessert Table (see it HERE) that inspired me to design this DIY Black Widow Spider Pumpkin Pedestal for Oriental Trading’s blog. Want to know how to make it? CLICK HERE for my step-by-step tutorial and shopping list to make it. SUPER EASY & AFFORDABLE! 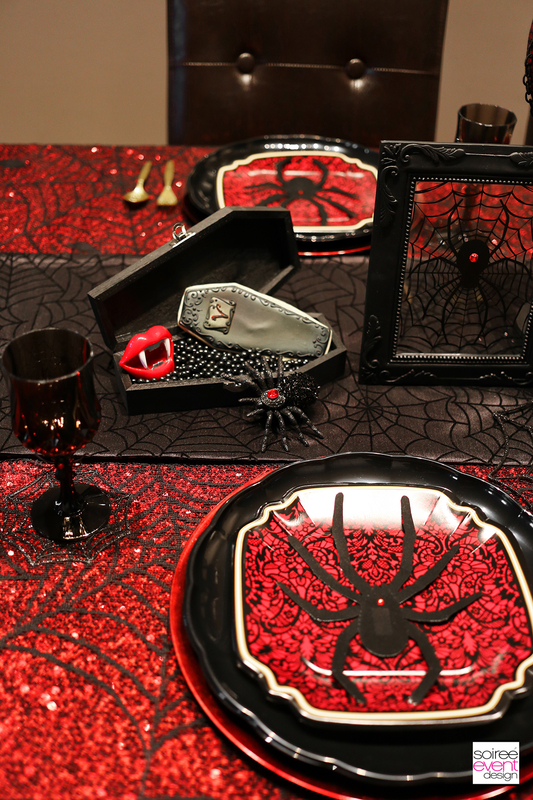 SET THE SCENE FOR A BLACK WIDOW SPIDER HALLOWEEN DINNER PARTY! 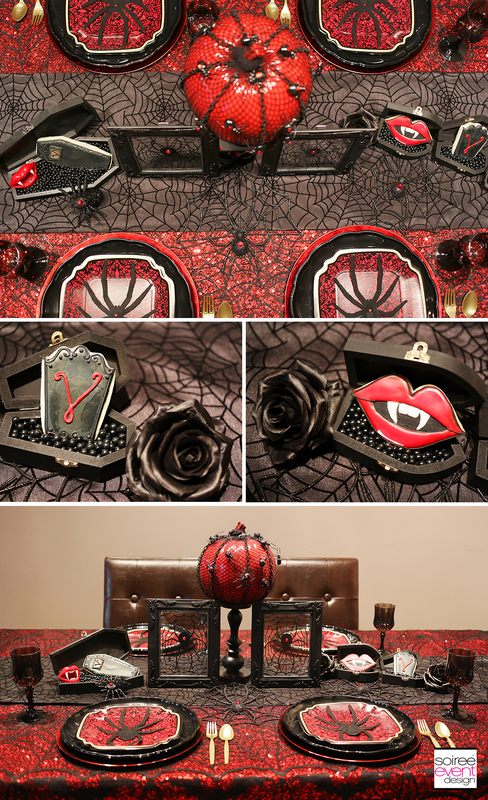 Using the DIY Black Widow Spider Pumpkin Pedestal as my table’s centerpiece, I designed the entire table around it. 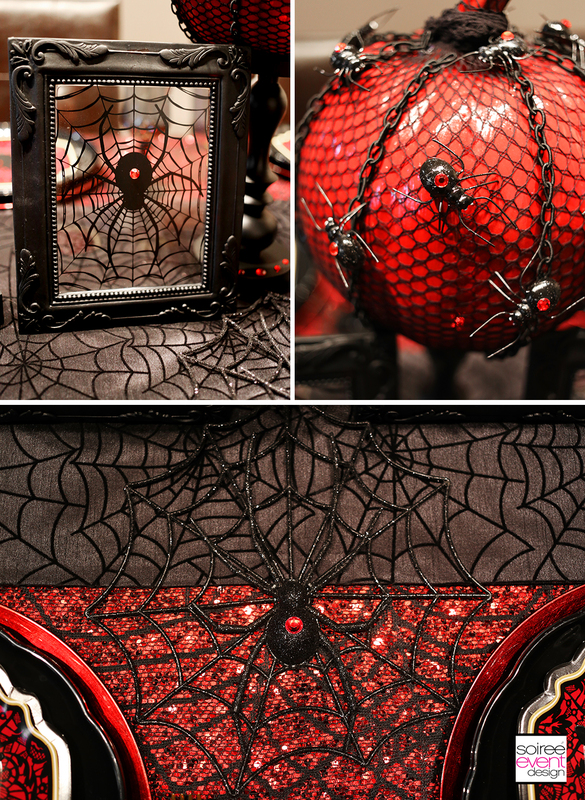 I found these cool spider frames at the dollar section of Target and went into my Halloween stash to find these spider web wall hangings that I instead laid flat on the table and embellished them all with a red rhinestone sticker to make the iconic Black Widow. 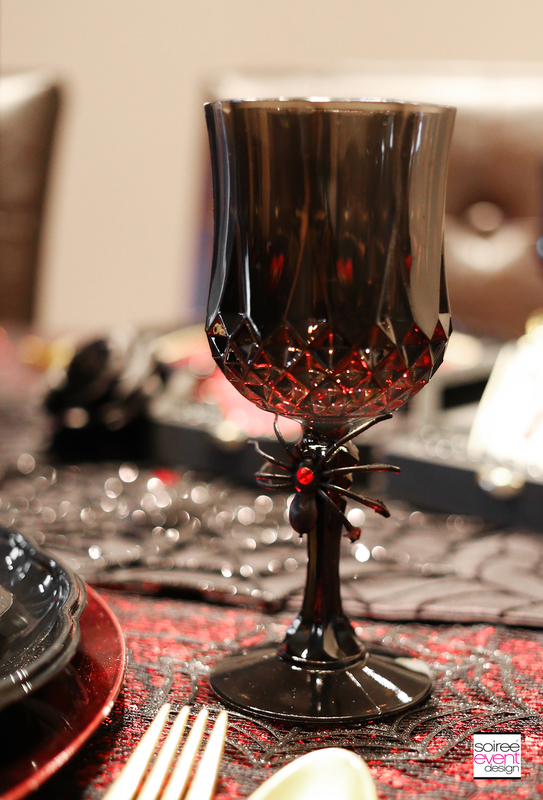 I also found these FABULOUS Black Patterned Wine Glasses that I embellished with a plastic black spider with a red jewel. GIRLFRIEND TIP: When creating your place settings, layering is key! 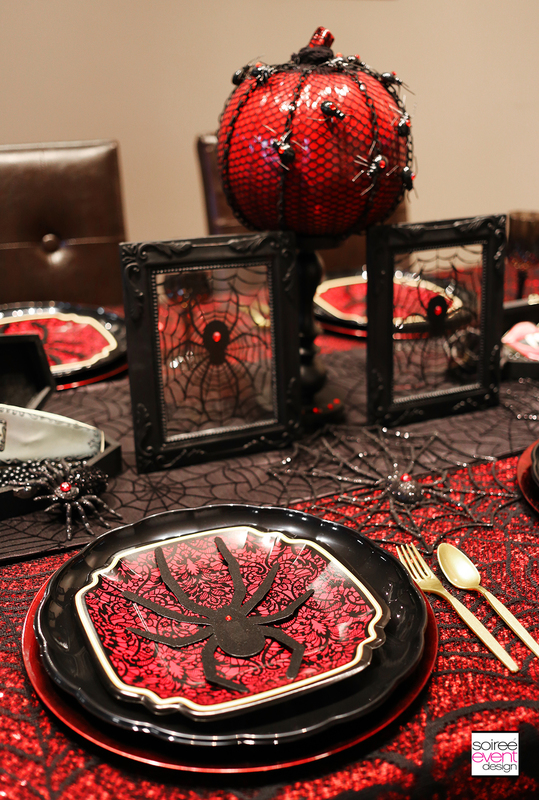 I started with a red charger plate then topped it with a Black Scallop Tray and a patterned paper plate. Then to pull in the black widow theme, I topped it all off with a Spider Wall Decal that I also embellished with a red rhinestone sticker. 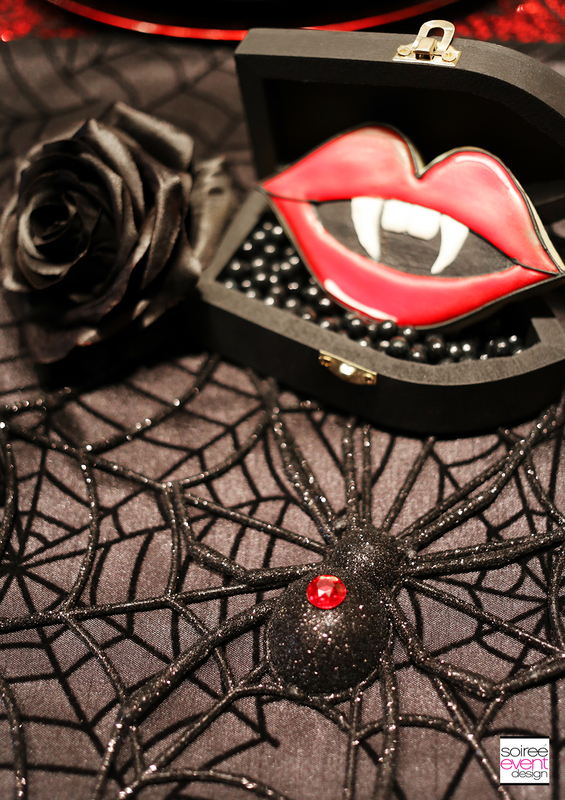 Now that is spooky chic, right?! SERVE DESSERTS THAT MATCH YOUR DINNER PARTY’S THEME! 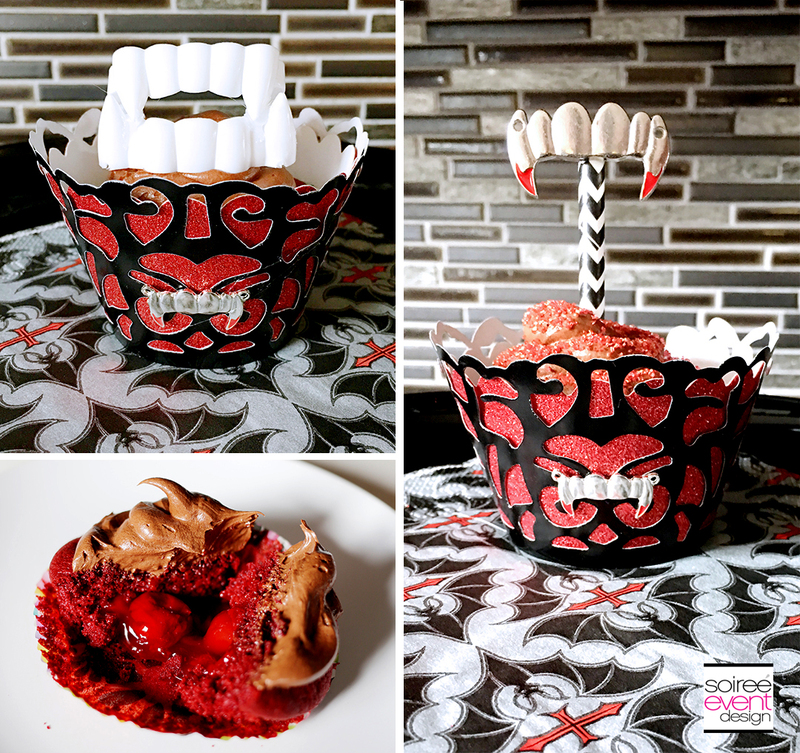 Serve custom iced cookies by Auntie Bea’s Bakery and get creative in how you display them by sitting them in a coffin filled with black candy beads or get in the kitchen and whip up a batch of these Vampire Chocolate Cherry Cupcakes with a oozy filling. Get the recipe HERE. Your guests will love these! Really creepy cool decorations. I’d love to try to decorate for Halloween using your guide. This is my family’s first Halloween in a house and I’ve been trying to go all out in decorating. I am definitely going to use some of these!! Cool Halloween decorations. Thanks for sharing. Everything just comes together and it’s definitely has its creepy elements which adds to the charm of the whole thing. I like the little details, like the spiders and the coffins. That is awesome. I lvoe Halloween and this is like so my thing. I may need to borrow a few of your tips. Looking forward to my invite to your Halloween party. what a great set up this year. Love the red addition. Love the whole set up! 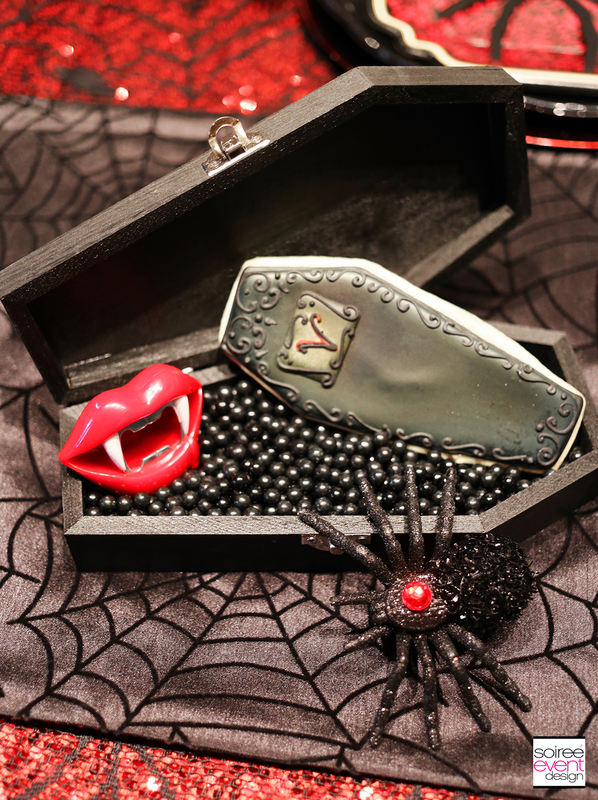 There is nothing more fun than decorating for Halloween! WOW! I love this! Such a fun look and it looks so inviting! I hope I get an invite! I think I’m going to go all out w/the spiders this year. My daughter used to get very creeped out by them but she doesn’t anymore, and I’m guessing my son would flip. Well done here! You always have the best ideas! I can’t wait to use some of them! This is so striking! 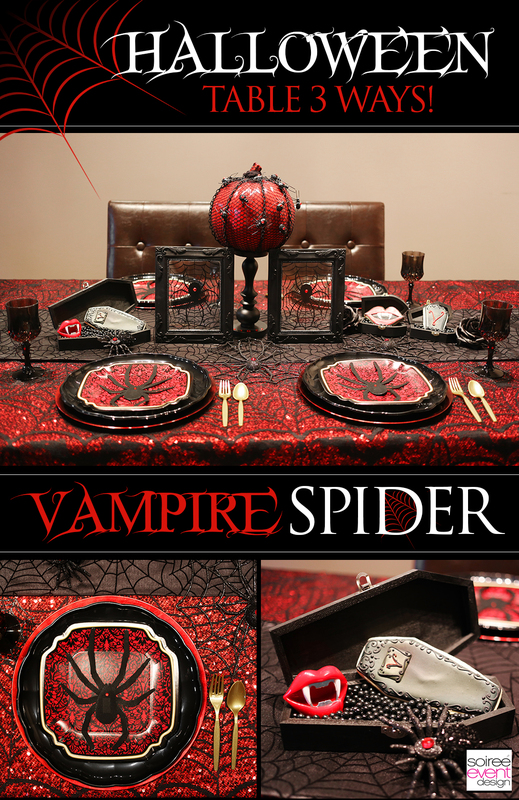 I love the black and red combo and the spiderwebs! WOW, what a wickedly cool table. I love decorating our house for different seasons and holidays. You did a great job! OMg loving everything about this!!!!!! Now I want to throw a party!!! You are very creative with this spider design. We don’t celebrate halloween but the elaborate setup is admirable. Wish I can decorate that creatively. I actually like this one better than the other spider theme, though I would never go wrong with either of them. Mix in a few red drinks and we’re on our way!